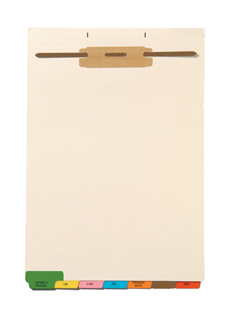 Fileback dividers organize large medical record charts for easier and more efficient access to patient information. Individual fasteners are factory installed on each divider allowing you to add or delete documents to any section without disturbing information in the other sections. Filebacks dramatically improve accuracy in filing patient medical records. Our fileback dividers have several standard features and custom options allowing you to design a divider system that best compliments your current filing system.